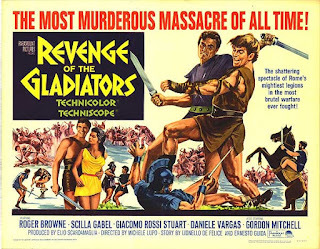 When Italy's Sword and Sandal genre is mentioned, Steve Reeves is normally the first name that comes to mind. 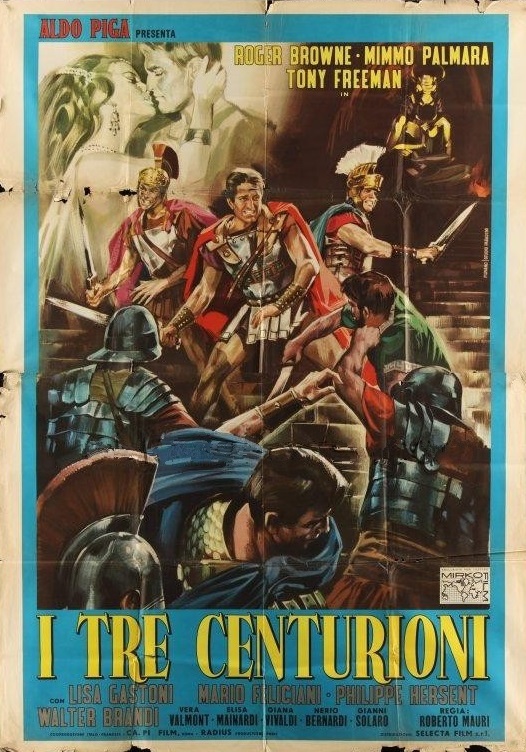 Many other actors followed in his footsteps--essaying characters of Herculean strength; Roman centurions framed by guileful throne usurpers; or gladiators embroiled in mortal combat by oppressors of freedom. Some of these actors made better impressions than others. One of the best, most charismatic of the lot was American Roger Browne. 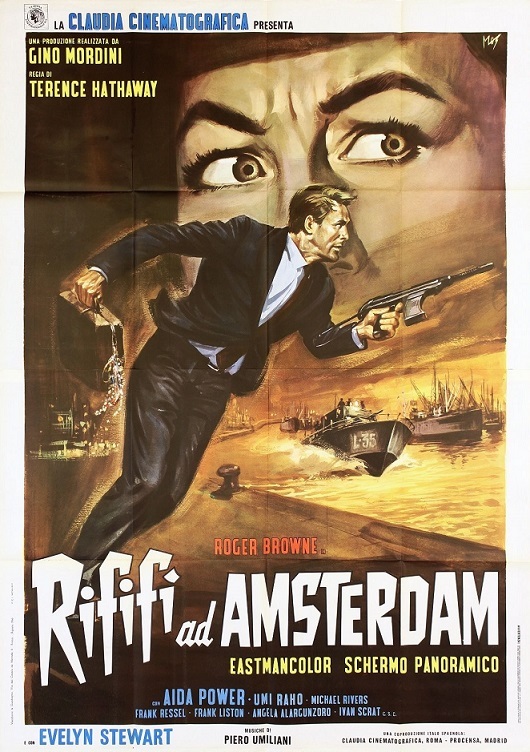 Starring in several Torch and Toga pictures--some of which are highly regarded as shining examples of the genre--Roger Browne made a comfortable transition from peplums to the Eurospy genre that was all the rage in the wake of the James Bond classic, DR. NO (1961). 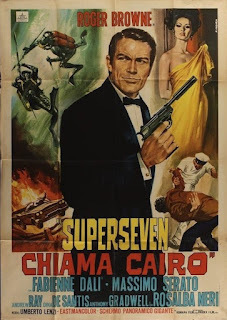 He's likely best known globally as the eccentric superhero spy ARGOMAN; or, under its original title of HOW TO STEAL THE ROYAL CROWN (1967; see insert). He filled out his resume with several other productions and television appearances before eventually leaving the industry by the end of the 1970s. 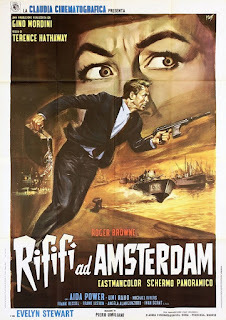 Roger Browne's contribution to the Italian film industry goes beyond merely appearing before the camera. Mr. Browne details what it was like making those movies and his other endeavors that made Italian genre pictures so memorable, and so much fun for fans of a bygone era. VENOMS5: You were born in Cincinnati, is that correct? ROGER BROWNE: My parents lived in Northern Kentucky. Fort Thomas, Kentucky, and evidently they didn't have hospitals in Northern Kentucky at the time so they went across the river to have me at Deaconess Hospital in Cincinnati. V5: How did you become interested in acting? Were there any actors that influenced you to get into the industry? A few days later I was at my fraternity house at UCLA and I told all the guys about it and they said 'give the guy a call, maybe you'll get to go on a studio lot and meet somebody, who knows?' So I called the agent and told him who I was... I grew up by the name of Bill Brown, by the way. I eventually used Roger, which is my middle name and that was the name I used for my work. So I called him, spoke to his secretary and she said "Mr. Wilson said you'd be calling." And I said, "He did? I didn't even know I'd be calling." So I went over and met the agent; he took me over to Universal Studios and showed me around. He took me over to Rock Hudson's cottage and introduced me to Mr. Hudson. The agent had to step out to make a phone call so I'm sitting there with Mr. Hudson and he asked me "What do you do?" I told him I was working in a health studio over in Beverly Hills and I give massage and exercise for clients--several of whom are in the movie business; Jimmy Stewart, for instance... Stanley Kramer, to name a few. So the next day Mr. Wilson calls me and says, "Rock tells me you're a masseur." I said, 'Yeah'. And he says, "I have a masseur over here at my house a couple times a week. If you can use the money it's $10 a shot, what do you think?" I said, "Sure, okay." I went over there and it didn't work out. He had other things in mind that I won't get into; but anyway, we didn't see each other for a couple years after that. In the meantime he'd gotten me into an acting school at 20th Century Fox run by an old time acting coach by the name of Ben Bard (see insert). That was my first exposure to acting and it ended up being kinda fun! I thought maybe it was something I could get interested in after all, whether as a hobby or a sideline. Then I met a girl by the name of Ramona Rush. Her big sister was Barbara Rush (see insert), a well known actress at the time. So Ramona and I were in class one day and she asked me, "Why don't you study with Estelle Harman, the woman I'm studying with over on La Brea in Hollywood? Give her a call and see about studying with her." So when the class with Ben Bard was finished, I went over to audition for Estelle Harman, who had been an acting coach at Universal. She worked with a lot of people like Rock Hudson and others of that ilk in the mid 50s. The next one I did was a union film called 13 FIGHTING MEN (1960) with Brad Dexter, Peggy Lee's second husband. I worked with Estelle for a couple of years and decided I needed a change. I got in touch with probably one of the top acting coaches at that time--a fellow by the name of Jeff Corey. 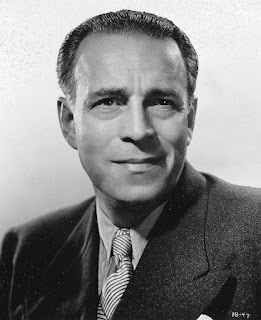 He'd been an actor but he was blackballed because of communist or pinko organization connections after the war. He was blackballed as an actor but became a very successful and well respected acting coach. So I worked with him for about six months before going to Europe. V5: How did you end up in Italy making movies? V5: Your first movie in Italy was VULCAN, SON OF JUPITER (1962), is that correct? RB: Yeah, that was my first film over there in an important role. Big part, small film. I was sort of discovered on that one. I'd gotten into doing English dubbing over there and I was sitting outside a dubbing studio outside of Rome and a fella came over to me and said, "Are you an actor?" I told him 'yes' and he said, "I have Emimmo Salvi over here, he's a director and producer. He's seen you and he'd like to meet you." So he sent me over and I met him and he told me about this movie he was shooting, VULCAN, SON OF JUPITER with Rod Flash Iloosh.You remember him? Big Iranian guy. Wonderful guy. Terrific guy. Not too partial to bathing but anyway, that's okay. So Emimmo tells me he has this role for the antagonist in the film, Mars God of War. He told me I'd have a lot of fight scenes and action against the Vulcan character and asked if I'd be interested in doing it. And I said, "Would I be interested in doing it?! Where and when?" (laughs) It was just like going to Rome--just give me ten minutes to pack! (laughs) It was a good experience. V5: You were a fantastic actor in these movies. 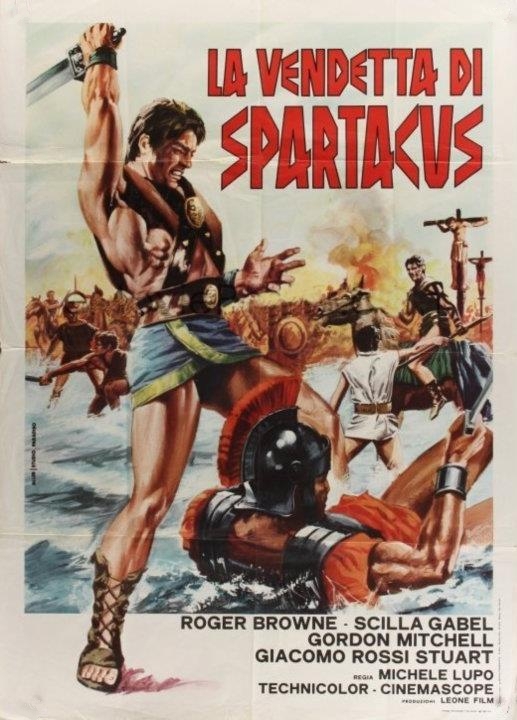 Next to you, Gordon Scott was an intense actor as well. You worked with him on the TV pilot HERCULES AND THE PRINCESS OF TROY (1965). Do you have any memories of him? RB: Gordon was a good guy. I didn't get to know him very well. We did one film together. He was a nice guy; an intelligent guy. He was a little bit flaky. I think he ended his career badly. I heard a story when he finished up in Europe he came back here and was living with Jack LaLanne. 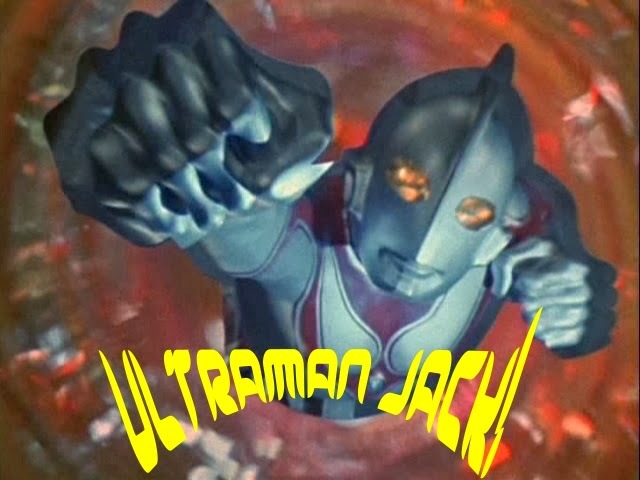 Jack was a very well known fitness guru on television back in the 50s and 60s. He did many feats of swimming across bays of water while pulling boats. 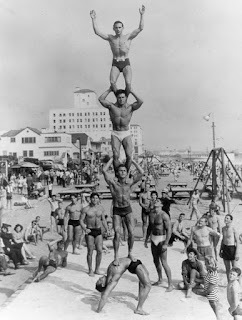 He was an acrobat at Muscle Beach and part of the Pyramid of Four (see insert; third from bottom). Anyway, I don't know at what point Gordon was staying with him, but he'd asked to borrow his 10-speed bike and Jack never saw him or the bike again. When I worked with him, Gordon was a funny, quite intelligent guy. I think Scilla Gabel had the hots for him. I don't know what happened to Gordon after that. Unfortunately, he's no longer with us. There's not too many still around. I'm one of the few remaining. I saw Robert Woods a couple weeks ago at the Autry Museum. 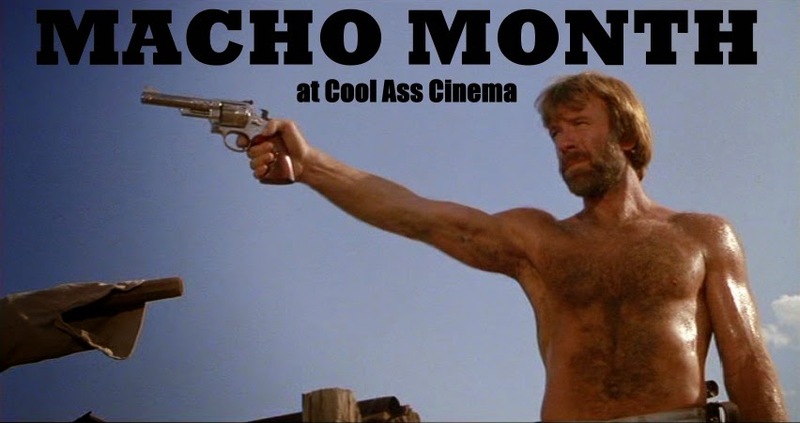 Once every two months they have a seminar on westerns. Robert invited me to go with him. I was over there for a couple of hours. V5: I'm not entirely sure, but I think Mark Forest is still around. RB: He's still around. He's teaching opera singing now. I never knew him. He was a big name when I was just getting started over there. I never got a chance to meet him. 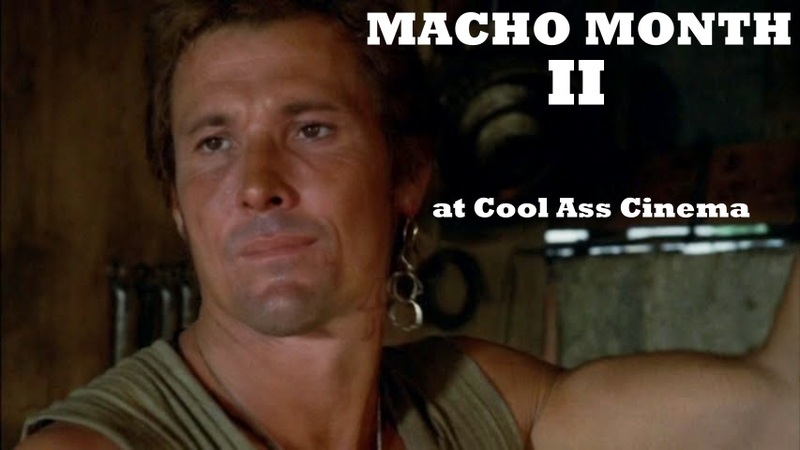 He had a nice career, big muscleman. Richard Harrison, whom I haven't seen for a lot of years, he's still around. Gordon Mitchell is gone; Brad Harris died last year; Dan Vadis died a lot of years back so there's not many of us left. V5: Mimmo Palmara passed away two years ago. RB: I talked to Mimmo on the phone probably about ten years ago. We were getting residuals from all the old films that were showing on television in Italy. And I was trying to work it through him so I could get the checks sent to me but it was too complicated and I think that whole program fell through. When I talked to Mimmo I don't think he remembered me even though we'd done three films together. One thing that impressed him the most was that I took so long eating lunch. (laughs) Mimmo was a good guy. He always thought he should be the lead in the film. He had a great look but it was a great look for an antagonist; and he did it well. Big, strong guy, athletic guy. But you'd never see him smile. I didn't even know he had teeth till I saw him eating. Another one who was like that was Giacomo Rossi-Stuart, remember him? Nice guy. Terrific guy. Good looking guy. A great horseman and very athletic. Very stern looking and always the heavy. He ran the emotions from A to B.
V5: You worked with Giacomo in an incredible trilogy of gladiator movies directed by Michele Lupo. What can you say about those? RB: We shot those first two back-to-back, REVENGE OF SPARTACUS (1964) and SEVEN SLAVES AGAINST THE WORLD (1964). Michele Lupo was really good with action and fight scenes. I wasn't a natural stuntman so I had to work hard at it. Just before I began work on those films they took me up to meet a stunt master by the name of Alfio Caltabiano whom you've seen countless times. 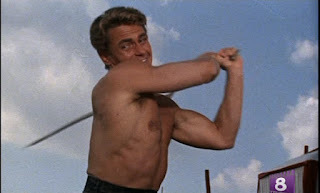 He took me up to his villa near Cinecitta for a couple weeks before the start of filming to work on fight scenes. I was a baseball player and a tennis player so I could move good and he made it so I could perform these fight scenes. After one long day of shooting on THE REVENGE OF SPARTACUS--it was the scene where I return home and find my family slaughtered and I'm fighting eight Roman soldiers--I'd been working all day and I'm soaking in a bathtub at De Paolis Studio trying to get the grime and the soreness out of me and there's a knock on the door. 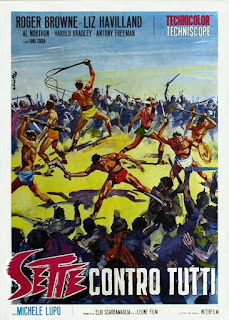 It was a stuntman by the name of Fortunato Arena; an old time stuntman. He came in and he said, "Roger, I want to tell you... you did good work today." For a stuntman to admit to an actor that he did well was like the highest compliment you could get; because for those guys, that was their living to do the stunts. So for him to take the time to come in and compliment me at the end of a day, I really appreciated that. V5: How long did you work on-set a day? RB: They were long days. There were no union rules over there. One thing they did was they'd send a car to pick up the leading actors. They'd pick me up at 7am and we'd reach the studio around 7:45 or 8am depending on how far away we were on location. Then you'd be in makeup for an hour. And maybe your first shot would take place around 9am. You'd work till 1pm then take an hour for lunch; then you'd go back and work till the sun went down. If it was in the studio, you worked till they turned the lights out. You might work 6 in the morning to 7 at night and you'd do that six days a week, too. It was not an easy life but I was happy to do it. I was just a redneck from Kentucky living and working in Europe and by God I was in hog heaven. And it was so much fun. When you're young you can handle anything in those days. The 1960s in Rome was terrific. V5: You had a good chemistry with Gordon Mitchell. Can you talk about your relationship with him? RB: Gordon was a good guy. He was one of the really good guys. I knew him socially, too. We did those two films together and he got me out of a jam a couple of times. They sent us to Trieste to do a film called 'La Morte Ha Ballato Il Twist'; 'Death Danced the Twist' in English. That film fell through after a few days. We were supposed to get paid. We were supposed to get Per Diem; something like 50,000 lira a day. I foolishly took very little money with me as I was counting on being paid for this movie. When the film was abandoned they told us we could go back to Rome. Well they'd only given us one-way tickets. I didn't have money for a ticket back to Rome. So Chuck... Gordon Mitchell's real name was Chuck Pendleton, he told me not to worry about it that he would take care of it. He gave me the money to get back to Rome--I paid him back, of course. And then another time, before I'd really got started working I couldn't come up with the money on this apartment I was renting and I called Chuck and I asked him if he could help me out and he said, "Sure, how much do you need?" It was a hundred thousand lira or so and he took care of that. Then I started to work--this is around 1961 or 1962--and I didn't have any problems. But on those two occasions I really appreciated that he was there for me. A really nice guy who is no longer with us. V5: Your leading ladies on these films were Scilla Gabel and Jose Greci. Do you remember much about working with them? Scilla Gabel (see above) was Sophia Loren's stunt double. She didn't look much like her, I don't think. She had the same bone structure, high cheek bones, voluptuous figure. She was perfect in long shots. Same thing with Steve Reeves's stunt double, Giovanni Cianfriglia. He didn't look like Steve but he had the same proportions. He was smaller, but very well built. In long shots you could believe it was Steve Reeves. Steve wasn't very athletic. He looked good and he could pose well, but with the right stuntman in all those action films, Steve was great. 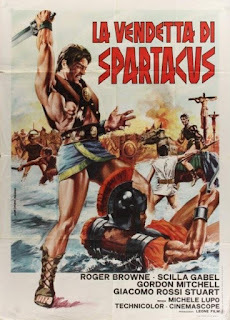 So many of us owe so much to him because he started it all with HERCULES (1957) and HERCULES UNCHAINED (1958) for Pietro Francisci. He was discovered by Francisci's daughter after seeing him in an American movie called ATHENA (1954). She said 'that's the guy' and the rest is history. 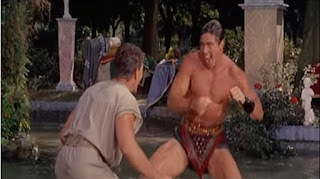 V5: Did you ever get to meet Steve Reeves? RB: I only met him one time. He was a friend of Dan Vadis and I met him when we were all shooting at De Paolis Studio once. Seemed like a nice guy but I didn't really get to know him. 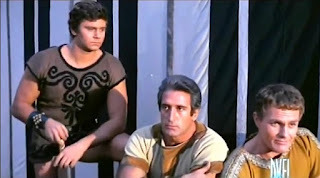 V5: You worked with Dan Vadis on THE TEN GLADIATORS (1963). What can you say about him? Did you keep in touch with him up till he died in 1987? RB: Dan and I we ran around together, we played tennis together. He was a terrific athlete. My God, I was just hoping he wasn't going to kill me in our fight scene or drown me or something. We looked good doing it, he made me look good. He was the head gladiator and I was just a Roman patrician. We were antagonists before we got together and formed the team but Dan was a great guy. I could beat him in tennis but he could beat me in about anything else. We used to go out and play football together at Villa Borghese. He was a terrific athlete. He was fast, he could run, he could do martial arts and everything... I ran into him once over here when I was working at the hospital. He was visiting a relative or something. We promised to get together but next thing I know he died. I don't know if it was to do with drugs or he didn't pay somebody off. He was into that life a little bit. I'm not sure what happened there but it was an untimely death, I think. He was a good guy, though. Brad Harris was telling a story once they were in someplace like Hong Kong or Shanghai and he had some cocaine spread out on the bed and Brad just about flipped. Dan pushed the envelope a little bit. Died in a car out in the desert. He wasn't even all that old. He was a hulky guy. Vadis didn't have a typical bodybuilder's body. He was naturally that way--big, athletic and strong. 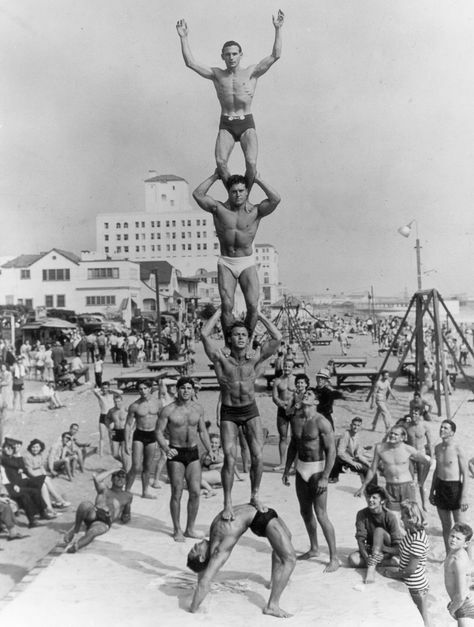 We worked out once at Muscle Beach before we each went to Rome. I was just a skinny guy trying to pump up my 13 inch arms. Roger on right side of Jayne Mansfield. I'll tell you another good guy who I never worked with but I met him because I worked with his wife in that film IT HAPPENED IN ATHENS (1962). It was Mickey Hargitay who was married to Jayne Mansfield... who didn't even know I was in the film even though I've got photographs all over (laughs). She had eyes for no one but herself. But anyway, that was okay. That was my first film when I got to Europe and I was glad to get it. But I met Mickey and he was very nice, very cordial; then I saw him years later in Rome in a restaurant with Gordon Mitchell. Mickey remembered me from IT HAPPENED IN ATHENS and he was a terrific guy; very down to earth, pleasant, sweet guy. V5: Was there any competition between the American and Italian actors behind the scenes; Or did everyone get along? 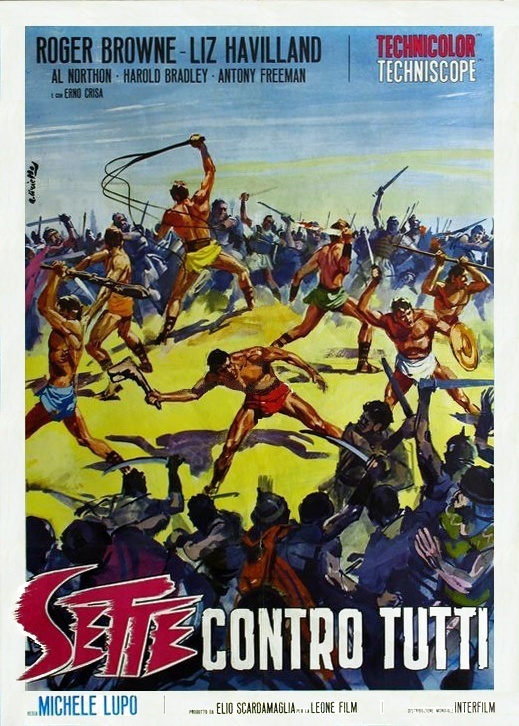 V5: There were several hundred westerns made in Europe prior to the end of the Sword and Sandal and muscleman movies. Did you ever receive any offers to star in any of those? RB: I started a western and was on it for one week then the money fell through. Other than that I never got the chance to do those. I don't think I was the western type in those days; between the age of 30 and 40. Maybe after 40 when I started getting some character in my face. I never saw myself as a western type. Maybe it's just an excuse but I'd of certainly done it. I don't think anyone saw me as a western actor. I was a much better fit for the spy films. V5: I think you would've made a fantastic James Bond. RB: Yeah, that was the goal of everybody to be James Bond. I've got photos trying to copy that look holding the gun across my chest. V5: Did you ever meet Sean Connery? V5: One of your best Eurospy pictures was OPERATION POKER (1965). What happened with Ken Clark, who was originally set to star? RB: That was another fluke. 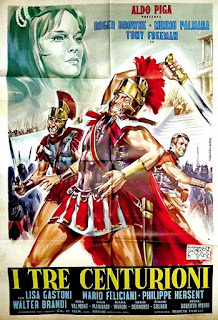 I got a call from a cameraman on the last Sword and Sandal movie I did, SEVEN REBEL GLADIATORS (1965). He tells me the director, Osvaldo Civirani, was having problems with Ken Clark. They wanted to dye Ken's hair black. He didn't want to do it because he wanted to keep the blonde hair. So they agreed not do it. So I was asked if I was interested in doing the film. And again, "Only if you give me ten minutes to pack!" (laughs) You can dye my hair whatever color you want. Just give me a chance to do something in clothes, you know? I went in to meet the director and they'd started the wardrobe for Ken Clark. They'd picked out the clothes at Brioni's in Rome so they sent me over there. Ken was bigger than me but we were more or less the same proportion. They could make minor adjustments to fit the clothes to me; and so that's how that turned out. 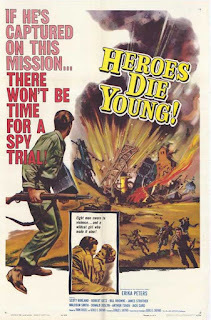 I got very lucky and got into doing Eurospy movies and adventure films. 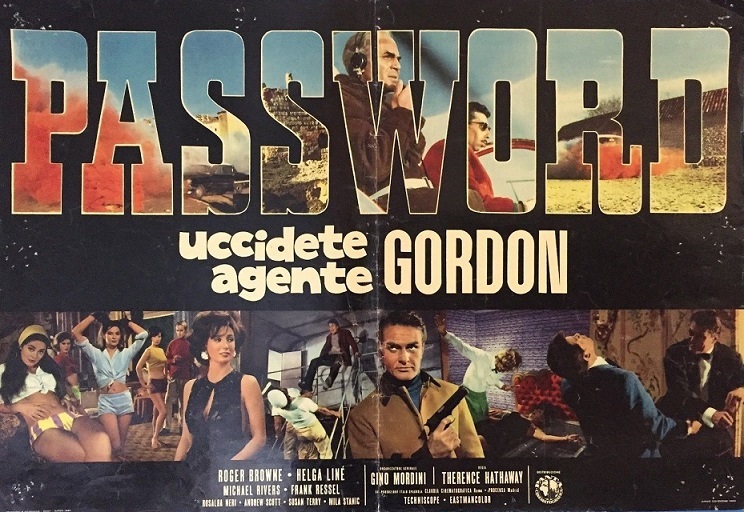 V5: You were directed by Umberto Lenzi on three of your spy pictures. What was your impression of him as a director? Another time on the set of THE SPY WHO LOVED FLOWERS (1966), Yoko Tani--who was a real flake--asked Umberto, "Che cos è La Fregna?" This is an Italian slang for a woman's private part. Without missing a beat Umberto responded, "Tu hai Bella, Emma Daniela ha brutta." In English that's "You have a beautiful one, Emma Daniela has an ugly one." Emma Daniela was the female lead in the picture. So that's how it was working with Umberto Lenzi. V5: Regarding your leading ladies during this period, what can you say about Rosalba Neri and Helga Line? V5: Did you ever have any off-screen romances with some of your leading ladies? Or were you married by then? RB: No, I wasn't married yet. I met my to-be wife in 1971 and by then the bulk of my career was over. I was working a little bit here and there but I wasn't doing any big parts anymore. My wife and I we married in 1976. Till then I led a normal, red-blooded life. Nothing scandalous or anything, but there's one I can tell you about. I took the family to Rome 12 years ago. My wife and Kelsey are walking down the street and we saw a billboard of Edwige Fenech who I was seeing for a little while after making SAMOA, QUEEN OF THE JUNGLE (1968). That was a tense moment there, but that was years before I'd met my wife. When I met Edwige I didn't know whether to date her or adopt her. (laughs) I decided not to adopt her. 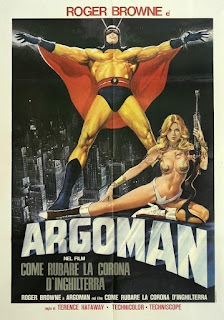 V5: ARGOMAN is likely your most well known picture. Was it difficult acting in that suit? RB: It was terrible. I couldn't see a thing. It was very uncomfortable. I did so much of the film in that costume. I had to jump onto tables and fight and I could hardly see anything. It was not an easy thing to do. You know, I'm glad I did it. If they had really been smart--and I'm glad they weren't--you couldn't tell who was in that costume anyway. It could've been anybody. The only scene I wasn't inside the suit was when he was running on top of the train. That was the only time I used a stuntman. I wouldn't of done that anyway because I probably would've fallen off the train, got knocked off or blown off by the wind or something. Everything else was me. V5: You had a well-written, complex, eccentric character. Did you have any input for the role or did you just follow the script as written? RB: No input at all. I hardly knew what I was doing when I was doing it. They gave me the script and all I could hope for was that it was a good translation of the Italian script. They usually were. Every now and then you'll come to a line that they'd need to adjust a little. 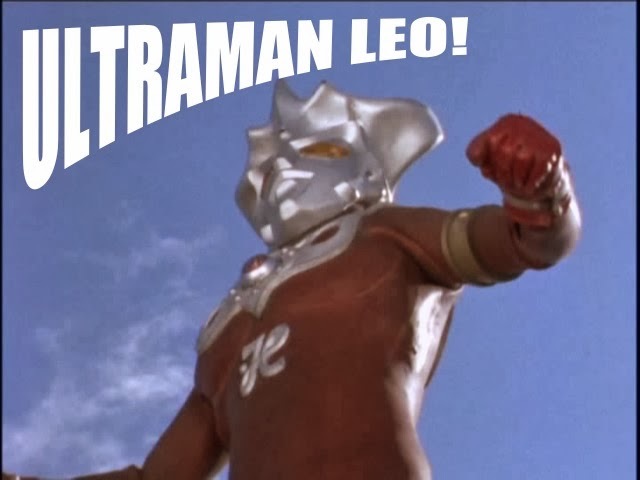 They make a lot of changes in the dubbing anyway. Dubbing was a way of life over there. It's a way of life for their own films that they dub in their own language because after the war they used so many people right from the street that they'd put in the film. They'd have the right look for the part, like vegetable sellers or things like that. They would get the theater actors to dub them after shooting was done to round out the part. I don't know what they're doing now; maybe they're doing direct sound but back in those days you'd have a guide track to help the adaptation for the dubbing. Sometimes it didn't make any difference what you said they were gonna change it anyway; or change the dialog in the dubbing studio. 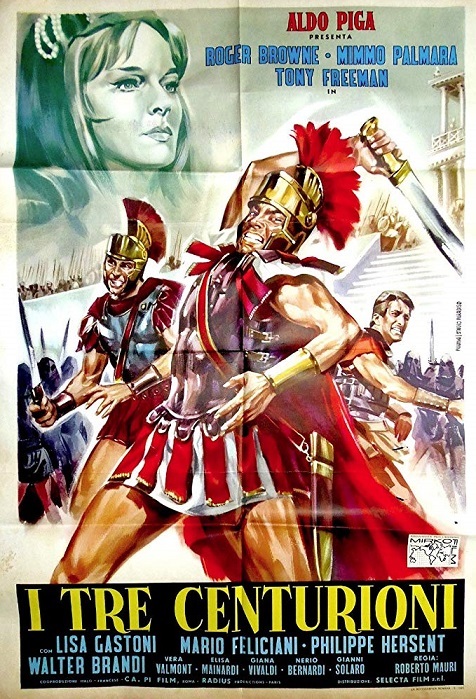 I did a film called I TRE CENTURIONI (THE THREE CENTURIONS ). When I got the script it was a literal translation from the Italian. It wasn't made into speakable English. It was impossible. I told them there was no way for me to do this in English. There was no time to have it redone by somebody and adapt it; and I wasn't gonna do it myself; they weren't paying me to do an adaptation and it wasn't my niche anyway to write dialog. So I told them I was just gonna do it in Italian. So I shot the whole film in Italian and they dubbed it afterward. There was a dubber by the name of Pino Locchi. Nice guy. Little guy with a deep, very masculine voice. He was the one who dubbed all the heroes in the Italian films. 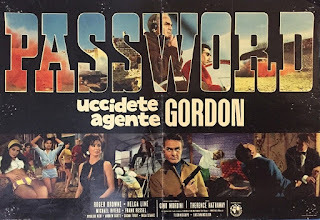 He did Terence Hill in Italian; Giuliano Gemma in Italian; he dubbed me in Italian; other people too like Brad Harris and Gordon Mitchell... a lot of people. 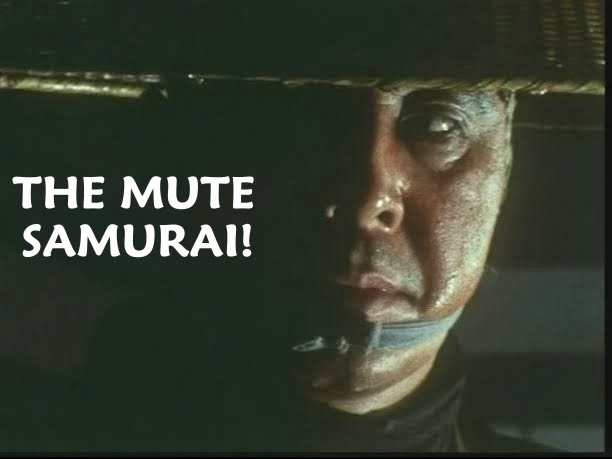 I dubbed myself in English but spoke Italian in the film. That turned out to be a peculiar situation, but it was fun. V5: So you could speak Italian? I was called in to test for an actor by the name of John Philip Law in 1963. He did an episode for an Italian television series where he was supposed to speak Italian. They wanted somebody who spoke Italian but had an American accent. So I did that and at that point, I figured I was speaking Italian pretty well. V5: Of the two major genres you worked in--the gladiator and spy genres--did you prefer one over the other? RB: The spy pictures were more interesting. They're more modern. I got to travel a lot. I went to Spain a few times; to Switzerland a few times; Greece was another place... they were more interesting from that point of view. 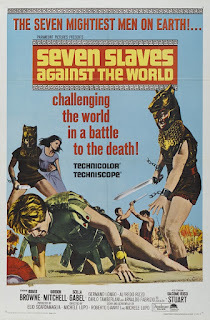 The Sword and Sandal movies were fun, they were hard work; a lot more physical. For their time they were fine. I liked the process of acting. It was fun and exciting. Even today; I don't do that much today but when something comes up I do it and it's still fun to do. V5: This goes back to the dubbing discussion, but I'd read you were the president of ELDA, the English Language Dubbers Association. Can you elaborate on that? RB: I was the president for nine years. I sort of fell into it. I was on the by-laws committee before. The opening came available and I didn't wanna do it. Somebody chose me and somebody else wanted to do it named Michael Torp. A very intelligent guy but if we had him as president it would've gone downhill; no telling what would've happened. So I got in there by default. It was nothing all that prestigious. It had its problems. I got mugged once carrying money back to the office. It was interesting. I might've got a little bit more work from being president but most of my work was from having established myself. We weren't legal with the government at that time. It was sort of a fly-by-night outfit. We functioned as a union but it wasn't official. We just sort of established the rates, made them more fair. We went on to a line count--so much per line of dialog. I was the point man on establishing that. Two things I did as president was establishing the line count--changing the whole financial system; and I was the first person to get the ball rolling by no longer allowing smoking in the dubbing studio. I just got sick myself standing up at the Dais trying to dub and the dubber next to me is smoking cigarettes and the smoke is curling into my eyes while I'm trying to do a scene. So those are my greatest claims to fame--the line count and no smoking in the studio. V5: What years were you president? RB: I was president from 1966 to 1975. In 1975 we got organized, got a lawyer and made it official. It's a shame it didn't happen earlier. If you're a lead for 20 years you can qualify for an Italian pension, Italian social security. I was at 20 years and I get Italian social security today. It's been great. But if I'd had those 15 years of dubbing--I did a lot of dubbing in those years from 1960 to 1975. If I had that going towards my social security, that would've been very nice. But people started ELDA on somebody's kitchen table. 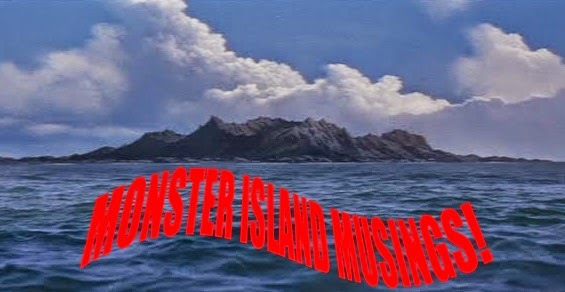 Back in the late 50s, they had these films and they needed somebody to dub. They needed people who knew something about acting and they had a few English teachers there and a few actors around town; they got them together and started dubbing films. You learned by the seat of your pants. When I got there in 1960 and got in on it and learned what to do and how to do it... it was not an easy craft. We didn't have all the technology of today to move things into place. Back then we had to pretty much hit it on the mark. It was quite an industry in itself over there. V5: Why did you leave the industry in 1980? Had you grown tired of acting or was it something else? V5: Out of all the years you worked in the film industry is there a film or films you're particularly proud of? And is there one you wish you'd never done or wish you could do over again? RB: I liked most of them that I did. I liked all the Sword and Sandal films I did except for THE THREE CENTURIONS (1963). I did the most dangerous scene I've done in my career. I'm going downhill and the horses are pulling me down and I have to jump off because the horses are going over. I jump off and when I landed everybody gasped and thought I'd hurt myself really bad. I'm okay and I'm thinking how good this is going to look on the screen. But the filmmakers did such a poor job shooting it you never see the stunt; it was like I jumped off a stool or something. I'm particularly fond of the three I did for Michele Lupo. 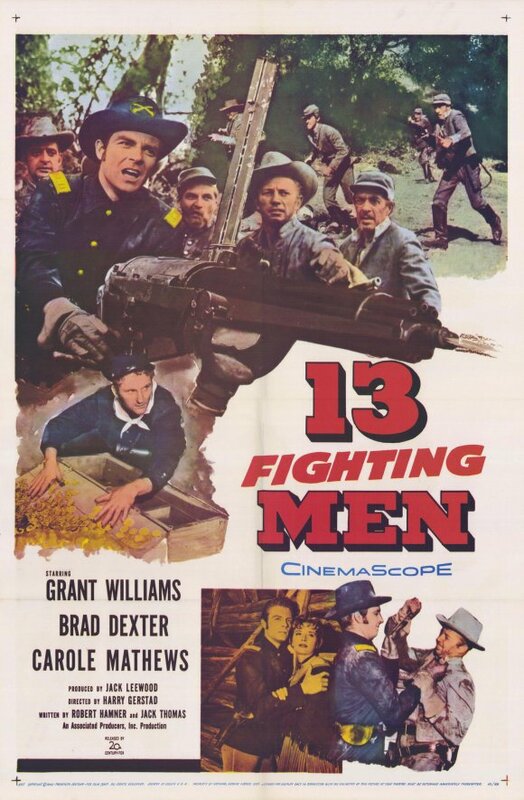 They had good fight scenes and good production values. ARGOMAN has the most production value of them all. 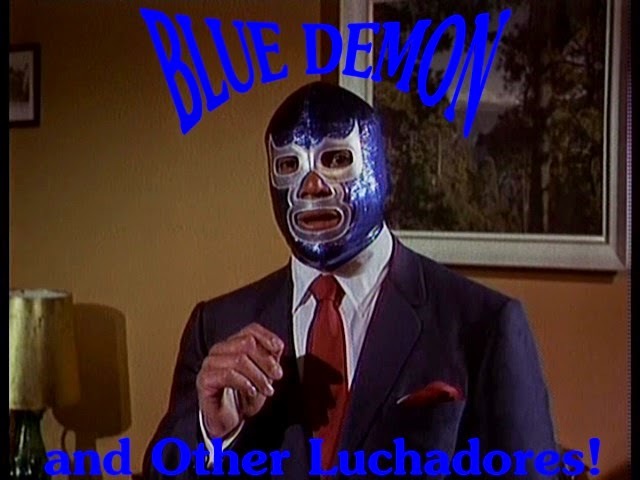 The Lenzi films I enjoyed making. They were clean; nothing spectacular, but I had good people all around me on those. 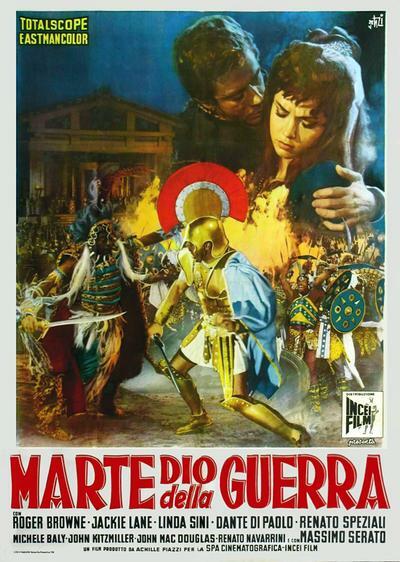 V5: There's one film you did that's difficult to find, even in an Italian version, called ATTACK ON THE STATE TREASURY (1967). It's a spy/heist type picture. V5: Last question. Is there anything you'd like to say to your fans, and to any who may be discovering your work for the first time? RB: Yes, I'd like to say where were you when I needed you? (laughs) But seriously, it's nice to be remembered after all these years. Something's happened in the last few months. People from all over the world--from Norway, Switzerland, Germany, France, Canada, certain places in America... people sending me things or wanting autographs. I don't know what's happened. This never really happened all that much before. I didn't pursue it. When we came back to America in 1980 and I started back working in the hospital I had opportunities to do interviews but I didn't really have time and I really wasn't interested in it. My late wife used to do some of those things for me and she saw that I wasn't all that interested in it. I was married and had one child at the time, and then Kelsey, in 1985. But with this new interest in my work, it's heartening to know there's people who remember who I used to be. I'd like to thank Roger Browne for taking the time to participate in this interview. I would also like to thank his daughter Kelsey for setting it up for me. I wish Mr. Browne and his family all the best in their future endeavors. You can find him on Twitter HERE. You can find him on Facebook HERE. You can also see him on the ELDERS REACT series on youtube HERE.